A week or two after Kate was born I remember sitting on our brown leather couch in the livingroom of our old house in North Texas. Kate was still in the NICU — and in a break from visiting her, I sat with my laptop upon my legs, googling: More children after child with Down syndrome. It seemed silly at the time. I had JUST had a baby — why was I so focused on future children? But I had so many emotions within me. Would I have the big family I had always wanted? What if we had more children who had Down syndrome? I didn’t even know what it would mean to have one child with Down syndrome — let alone more than one? How would it affect her siblings? Would it be good for us? Good for her siblings? Good for Kate? My life as I had imagined it already felt pulled from under me — now would I give up the dream of having a big family, too? But slowly, over time, I had all the answers to those questions. And to be clear, my answers won’t necessarily be your answers — every family has many unique, personal reasons for their family size. The first reason was Kate herself. We learned quickly that her Down syndrome was not a catastrophic event in our life. The “extras” that came with her diagnosis: extra doctors appointments or extra therapies were not overwhelming issues in our life. She was — and continues to be — just another one of the bunch. Sure, she may live with us a little longer in the future (or maybe not!) and she may continue to require some of those “extras,” but in our personal situation, her “special needs” feel the same as any of our other kids’. We feel that we can be just as good of parents to additional siblings — perhaps even better ones — because of her life. As far as the statistics for having another child with Down syndrome — yes, there’s a slightly increased “risk.” And, of course, it’s always concerning anytime your child has a condition that comes with the increased chance for other medical conditions. I’ve had a moment in the delivery room with both babies since Kate that I looked over cautiously at their wiggly body in the warmer and wondered: does she have Down syndrome, too? But if there’s anything we’ve learned from having Kate, it’s this: there’s a bigger plan for our lives — and so often, what we are first afraid of can become an incredible blessing. Studies are one thing, but I have no doubt that Kate makes her siblings better — and that her siblings make her better. She will never have a lack of love, friends, support and a cheerleading squad. Her little sister, 20 months younger than her, who everyone thinks is her “twin” is her best friend in the whole wide world. They spend hours each day holding hands, dancing, chatting, laughing, hiding in closets and under covers, singing, giving kisses and hugs. Kate’s little sister and precocious 5-year-old brother are the best speech therapists, occupational therapists, physical therapists, play therapists and friends she could ever have. They challenge her all day long with communication and interaction — they treat her like one of the bunch, never making her feel like she’s an outsider. She has incredible confidence that she can do and be anything any other 3-year-old can be — and mostly because of the little gang of loving humans she’s constantly right in the middle of. As they grow older, I have many dreams for my children — I imagine how their relationships will only flourish — how Kate will add such beautiful color, beauty and perspective to our unique family tapestry. In a world where we long for our children to have the qualities of compassion, selflessness, joy and purpose — Kate is such an incredible facilitator of those things. If anything, Kate’s life only makes me want more children — not less. The third reason is faith. I say this to anyone who approaches life from the perspective that children are a gift — and that there’s a bigger plan for our lives that isn’t always based on what we think we want at any given moment. This is obviously a personal thing for our family — and may not affect how your family decides whether or not you should have more — but for us, it’s a profound factor. I am aware that every pregnancy is a gift, not a guarantee. I am aware with every healthy moment that at any moment, any of us may not be healthy. I am aware that every day I live — and every child I have — and every moment I breathe is a blessing. And for that, I live with incredible gratitude. 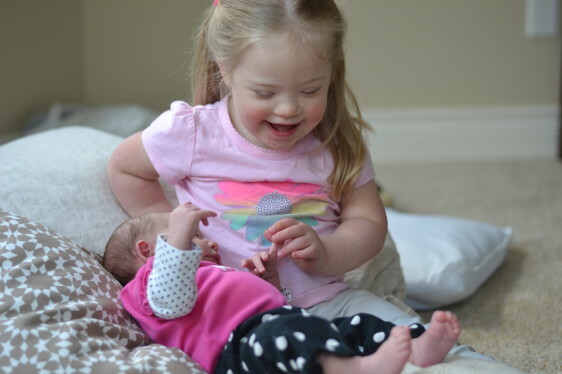 I am also aware that when Kate was first born with Down syndrome, I was scared and sad and confused — and that now I realize she was one of the best things to ever happen to me. And so, I close with this — the decision for us to have more children after having a child with Down syndrome is a combination of the joy in our present and the faith in our future. In our family, Kate helps us be better and we help Kate be better and isn’t that the goal of every family? What a joy-filled photo of your girls. My daughter, Lyra, who also has Down syndrome, is my fifth and last child. She is also my only daughter (I’m so thrilled she’s a girl!). Now that she is nearly two years old, I see so many other moms whose have children with DS who are Lyra’s age having their next baby. Having multiple little ones is always a lot of work–harder than multiple teens in my own experience. But such a gift for everyone. The longest relationships in most people’s lives. I am so glad to have read this. My husband and I have been talking about having another baby. Our first child a son named Trenton was born with DS. We were both 28 when he was born and many people are always confused as to how we had a child with DS because we were so young and I try and explain that those statistics are not 100% accurate and I tend to say that God blessed us with such a gift. Overall, he is pretty healthy but does require a lot of therapies and often many visits to the ER during the winter months because of breathing issues, mainly bacterial. But I think, how would we be able to rush him to the ER (1 hour and 15 min away) and have another child. My family lives close and I know they would be there to help, but it still overwhelms me to think about. But we are going to give it to God and see if he wants to bless us with another baby. After Trenton was born we were told we had a 1 and 100 chance of having another baby with DS. Did your obgyn give you any advice or tips to do before you tried for another baby? I talked to one of the specialist and they mentioned something about increasing prenatal vitamins before becoming pregnant. Thank you! I really appreciate the comments and the blog! I love reading this daily! Every time I read your posts about Kate I just think, “you totally hit the jack pot!” And it’s the same for other close family members and friends who have children with different abilities…they feel so blessed. You are so right–you make her better and she makes you better, which is exactly the divine purpose of families. I am so excited to see her (and the rest of you!) soon! My 29 year daughter is #4 of 5 children. She has struggled with many behavioral issues, but has been a blessing to her 4 other siblings. In fact she is the maid of honor in her younger sister’s upcoming nuptials. Her sister claims the reason she studied psychology & marriage & family therapy is because of her DS sibling. The siblings are all close in age, 7 year difference between the oldest & the youngest. They are very supportive of her & would do anything to make sure she is suitably matched in her residential home & that her future is financially taken care should anything happen to mom ( her dad is deceased). Having another child after my DS daughter was not a difficult decision. There were always playmates within the the home & chaos ( which she thrived on) was a wonderful stimulator. Kudos to mom’s who don’t quit after the one. Kathy, we sound like we’re on the same baby timetable (5 in 7 years!) We’re on 4 in 5 years, so we’re close 🙂 I think you’re so right — the playmates in the home who love and understand her ARE such a wonderful stimulator. I think it’s the best “therapy” she could have — and that we could have! I had two more children after my son with DS. He is a second child. After he was born, my concern was what would happen to him when we are gone. We both decided to have another so that he would have others to care for him and the siblings could share in the care instead of feeling it was all on them. We did not have an amnio, as we wanted to be surprised for the next two. Now that he is 26, I am so happy I made that decision. He has his “grown-up” home with 3 of his friends, but there are still things to check up on that his younger sister is really great at, since she worked in a group home while going to nursing school. He got to go to school with both sisters, and has a wonderful brother (the youngest) to relate to. I wouldn’t have done this any other way. Mary Beth, I love hearing about your family. I think about this same thing with Kate. She’ll have so much support and love around her — and more people who can enjoy how lovely and wonderful she is! Truly a blessing for everyone. Replace Down Syndrome with Autism or Neural Tube Defect, and I could have written it. Whether or not to have children, is a personal and complicated decision. But special needs shouldn’t make anyone think it can’t or shouldn’t be done. And I love your idea about “extras”. As a mom who believes in creating a world of understanding and acceptance for my kids (as opposed to curing them, when I don’t think they need to be cured) I long ago learned to see their needs as extras, but not their disabilities as catastrophes. Love this, Anne. So beautifully said! When I had my first child Timmy at 42 and found he had Down Syndrome, I never paused for a second to think if we better have a siblings or not. I knew we needed to have a big family to rally for Timmy. I have also chosen to leave my corporate work life to raise my 3 boys as well. Its never dull in my house with Timmy 5, Augie 2 1/2 and Cal 13 months. The fact I can even stop to write this means its nap time which seldom happens for all 3 at the same time. Its the hardest low pay job I ever had and best one by far too! Thank you so much for publishing this blog! My husband and I had a birth diagnosis of DS in our 4 month old son. When he was born my world was shattered, and like you all I could focus on was having another child. I guess, what I have come to realize, a perfect child. My son is 4 months old and is the light of my life. Next to the extra drs and therapy like you said he is just like any other four month old baby. My husband and I are not carriers of DS, but the thought of having more children in the future still has me asking “What if? But like you I have learned that rely on my faith that God has a bigger plan for all of us, something bigger than we ever envisioned for ourselves. I want to say thank you again for writing your blog. Because it was through reading this that made me realize that life and everything will be OK. We just need to have faith that, in the end, everything will be OK. If it’s not ok, then its not the end. By reading this blog it has given me a more clearer and brighter future about having more children and something I should no longer be worried about. My little sister has Down Syndrome. I am #2 out of 7 children, she is #4. Our mom was also young when she had her- only 27. My world is greater because of a young woman almost 3 years younger than myself who looks up to me everyday and tries to imitate me. Now that I am away at college, she is taking over my role at home of helping our mom take care of the youngest- a 9 year old girl who also has special needs. My DS sister is my copycat in almost every way- she loves to do anything I do. She is learning how to play the violin and is so proud of herself. She is eager to complete her schooling so she can join me at college. Our siblings who are younger than her look up to her and protect her. Down Syndrome, I have learned, is not a thing to be feared but a thing to rejoice in. Thank you for writing this post! 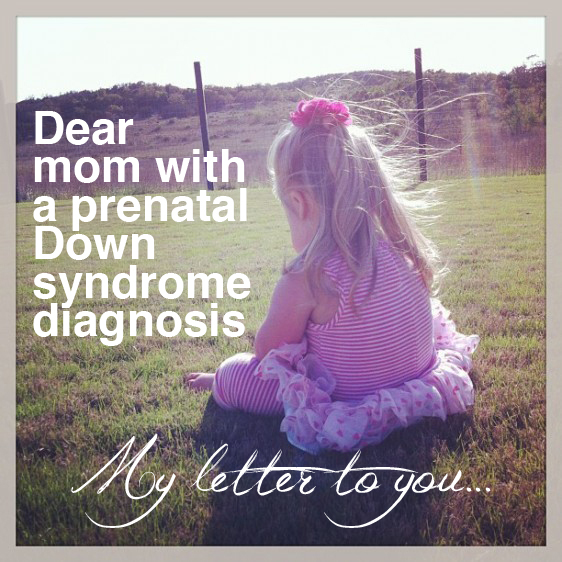 I am pregnant with our second daughter and we have a prenatal diagnosis for DS. We would like more kiddos, I’m not a particularly young mom but I am a woman of faith and hope that God will be with us as we allow those answers to our questions be realized. I am loving your blog! I am 45 and pregnant with #6 child. To say that having children was over for me was something I could not come to grips with. Inside my soul I just so sad to think it was all over for me. My family always has a negative view on my age & babies, but am I being selfish in knowing my chances of a special needs child? I am barely 5 weeks or so PG, so know knowledge of what God’s plan for my life ,but reading this blog has helped ease my worry. I’m so scared and don’t want to feel guilt if my age plays a role in my baby’s future. You ladies are awesome & than you.